Big colour screen - 240x400 pixels, 76mm across the diagonal. The compared with 60CSx which has a 160 x 240 screen, 67 mm across. The Colorado is a little shorter and wider than the 60CSx. The weight is about the same. The rubberised back is nicely curved to fit easily in the hand. The controls are easily reached with your thumb, whether you're left or right-handed. The screen is one of the stand-out features of the unit. At 240x400 pixels, 76mm across the diagonal it's large and clear. The text and linework appear to be anti-aliased making them very clear and readable. The backlight is not as bright as the 60CSx, but visibility is fine in all the lighting conditions I tried. The screen is much less sensitive to viewing angle than the 60CSx screen. The backlight appears to be quite a bit brighter when plugged into vehicle power. The buttons and rocker of the 60CSx have been largely replaced by a control wheel. The next section describes the controls in more detail. The back of the unit is covered by the rubberised slide-on battery cover. The cover has a mounting rail that is used for a selection of mounts that slide onto the rail. A carabiner mount is included with the unit. If you don't like the carabiner, you could easily replace it with a wrist strap. The mounting rail works well with the car mount and is much easier to use than the 60CSx's car mount. The USB and external antenna connectors and the power switch are located on the top. Garmin say the unit is IPX7 waterproof, and does not float. I didn't check this. There seem to be a lot of reports on the Internet about leaking. Looking at the design, it would pay to take care that the seals are clean and the back is fully seated - don't rely on the locking catch to pull the back into place. Battery life is shorter than the 60CSx. The Garmin manual says up to 16 hrs. With 2500 mAh NiMH batteries I was getting 8-10 hrs. How much you use the backlight, redraw the maps and have the compass turned on etc will affect the life. Also some of the firmware updates have fixed battery related problems, so make sure you're running the latest firmware. For use in the car, there is a car kit with a suction windscreen-mount and a special lighter power cable that plugs into the USB port on the unit. It's a lot easier to get the unit on/off the car mount than the 60CSx. The screen backlight is a lot brighter when running off vehicle power. According to the specs the unit uses a different GPS chipset from the SiRF-III used in the 60CSx. Under heavy canopy the Colorado seems to work as well as the 60. The controls on the front of the Colorado consist of two buttons and the new "Rock ‘n Roller" input wheel. If you're used to other Garmin handhelds, the input wheel may take a bit of getting used to. However, with a little practice, the wheel is very quick and easy to use. The input wheel consists of three parts. The outer ring rotates. 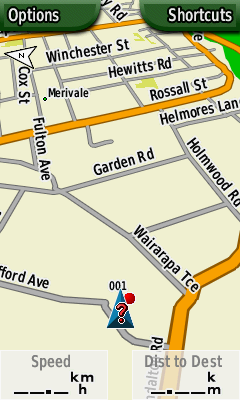 In the map view this is used for zoom in/out. It also scrolls up and down in menus and chooses input characters for text input. The inner ring is like the rocker on the 60CSx. You push on it to scroll the map view. It also scrolls menus up and down. At the centre of the input wheel is a button. This is the the "enter" key. It selects the menu or option that is currently selected. There are two "soft buttons", left and right at the top of the screen. Their function changes depending on the screen you are on. Typically the left button is used for an "options" menu and the right button is used for navigating through the unit's functions and menus. In the photo above, the left button displays the Options menu and the right button displays the Shortcuts menu. The Colorado user interface and menus make it feel a lot like a descendant of the Garmin vehicle navigation units like the Nuvi. Pressing right soft-button usually brings up the circular Shortcuts menu. 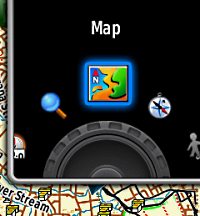 This menu has the major functions on it, map, find, setup and so on. Rolling the input wheel rotates through the options. You press the centre button to select the option that you want. On a 60CSx, you'd get much the same effect by repeatedly pressing the PAGE button. You have the option of customising the Shortcuts nenu to show the functions that you use most often. Text input uses a similar circular wheel. You rotate the wheel to find the character and press the center button to enter it. Text entry speed is probably a little faster than using the rocker button on a 60CSx. 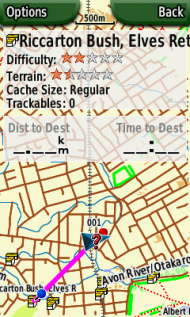 There are extensive options for configuring the GPS, and managing the tracks, waypoint, routes and geocaches. The best settings for different activities (tramping driving, marine etc) can be stored and recalled using profiles. There is more detail in the user manual - downloadable from Garmin. Overall the user interface is quite easy to learn and intuitive. The Colorado 300 has no detailed built-in maps. There is a world-wide map that includes relief-shaded terrain. As might be expected, this is quite coarse. At the 5km zoom level, or more zoomed out, it gives a nice impression of the land form, but with more zoomed in views of topo maps, it just adds annoying shadows to the map and is best left turned off. We've tried the Colorado with our own MapToaster Mobile/NZ topo maps and with NZ Open GPS Maps routable maps. The maps look great on the large high-resolution screen. 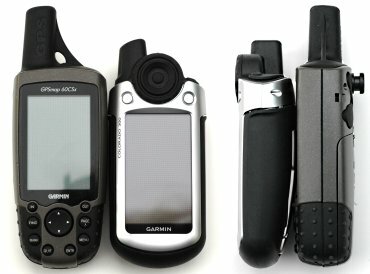 The Colorado has more extensive geocaching support than previous Garmin units. Geocache data from geocaching.com can be loaded directly into the Colorado using the "Send To GPS" button on the web page, or you can send a PocketQuery file to the device. The Colorado recognizes the geocache information and treats it differently from other waypoints. 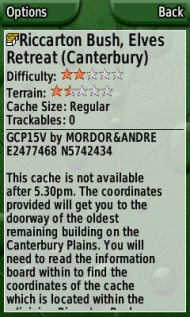 The consensus on the net seems to be that you can load about 2000 geocaches - I didn't confirm this. The geocache information you load onto the GPS can be viewed, you can mark the cache as found, but you can't modify, delete the cache or enter text against a log entry. 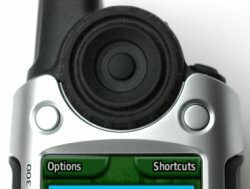 You can upload a Field Notes file directly from the GPS to geocaching.com, but you can't enter log text directly on the GPS. The following series of screen shots show some of what you can do. 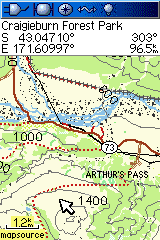 When you connect the Colorado to your computer with a USB cable, the GPS enters USB mass storage mode. The internal memory and SD card appear on your computer as a drive letters (e.g. they might be E:\ and F:\ drives). The Garmin Trip and Waypoint Manager software recognizes these drives as belonging to a GPS and will transfer the waypoints and track to/from the unit in the usual way. When you unplug the Colorado from the computer, the unit shuts down and must be restarted to restore GPS function - not entirely convenient. Saved or archived track logs are handled better than the 60CSx. The track log holds 10,000 points. When this limit is reached, the first 2000 points in the log are archived automatically, rather than just being overwritten. Even better, all the track points are saved in the archived log. On the other Garmin handhelds, you lose the timestamps when you save a track and the number of points in the track is reduced. The Colorado preserves both the timestamps and all the track points. If you're used to a GPS like the 60CSx, you there are important functions on the 60's that aren't available on the Colorado (though Garmin may well add these features in future firmware releases). Search - the 60CSx has two search modes when you use the "Find" facility. "Find by Name" locates POI that start with the letters that you have typed. It is very fast and allows you to locate places anywhere in the map. It useful for repositioning the map a long way from where you are. "Find Nearest" locates POI close to the currently displayed map postion. It's used to find nearby huts or gas stations or whatever. The Colorado only has the "Find Nearest" function. If you want to view the map away from the current position, the only option is to manually scroll the map there - too bad if you don't know exactly where that place is exactly. On a 60CSx you can use Find to position the map at another location. You can then zoom in/out and scroll the map at that location. The Colorado only allows you to zoom in/out at the "found" location, but not pan the map. Not very convenient for exploring the map. If you scroll the map, or use Find, to view another location, the 60CSx will allow you to use the "Find Nearest" at that location. This is very convenient for finding, say, huts near your destination, or gas stations or food at the end of your drive. On the Colorado you can only use Find from your current location. 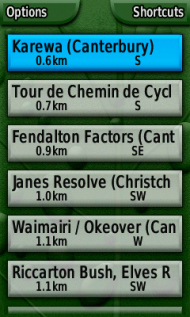 Many of options for controlling map display options are accessed from the Setup page. They're not all collected together on the map page menu like thay are on a 60. Slow startup. 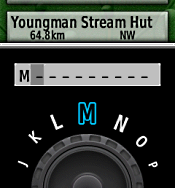 When you add new waypoints or tracks to the GPS, these are copied to the Colorado's internals store on startup. If you have a lot of points, it can take 40-50 seconds to boot up. If you add waypoints to the internals memory, they only appear to be processed once. If they are added to the memory card, they seem to be processed every time the unit is started. The map options are not all accessible from the map screen menu - some are on the Setup menu - could be better organised. Cannot change the track colour. Only one saved track can be displayed at a time (as well as the current track). The Colorado is a great GPS and has a lot to like with the big high-resolution screen, high-sensitivity, geocaching features and "Rock ‘n Roller" input wheel. At Integrated Mapping we have a selection of GPS receivers and recently the Colorado is the the one I use the most. If you're used to using a 60CSx, you'll find the Colorado to be somewhat disappointing for the reasons outlined above. If you're thinking about upgrading you might want to consider waiting to see what Garmin adds with firmware upgrades over the next few months. If there's anything you'd like to know about the Colorado I haven't covered, and I'll add it (BTW, we don't sell GPS units). The Colorado 300 test unit had version 2.51 beta firmware. 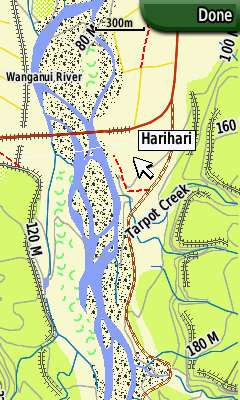 Copyright © 2008 Integrated Mapping Ltd. All Rights Reserved. This article may not be reproduced without permission. Check out our recently released review of the Garmin Oregon 300 & 550 GPS.